Belgian attacker to take pay cut to join Arsenal? 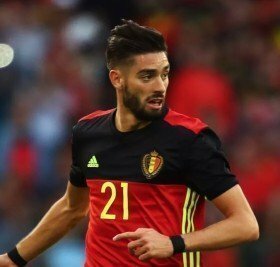 Belgian winger Yannick Carrasco is reportedly prepared to take a pay cut in order to push through a move to Arsenal from Dalian Yifang this month. The 25-year-old only joined the Chinese Super League side from Atletico Madrid last winter but he is seemingly keen on a return to his home continent after becoming increasingly unhappy in the Far East. According to Calciomercato, the Gunners have been alerted by the player's situation and their chances of signing the Belgian could be boosted by the fact that the attacker would be prepared to take a cut on his £9m annual wages. Still, the north London giants are reluctant to discuss a straight-cash move for the Belgian for the moment and this could play into the hands of other suitors including AC Milan. Carrasco has contributed seven goals and five assists since making his switch to Yifang last year. He is currently valued at around £40m by the Chinese Super League outfit.